It’s that time of year when we are decorating the home ready for Christmas. And if you have children like me, then you’ve probably done it already. Lots of us like to make changes to our decor, as well as put up the Christmas decorations, and there are lots of small changes that you can make that really add to the festive feel. Add lots of candles for a cosy, intimate feel. From tea lights to bigger candles, they can all be used to great effect to change the look of your room. Displayed in groups, or spread across the mantle they add a little magic and twinkle to your Christmas decor. I know it sounds simple but make sure you go through your home and do a little sorting. Christmas brings lots of extra people, often with an overnight bag, and usually with their gifts taking up extra space in the home. There’s lots of new toys for the children, lots of food and snacks stored everywhere and then you put up the decorations. Before you do this remember to go through each room and put things away, or send to the charity shop to make room for new items. It doesn’t take long but it will make you feel less stressed and ready to tackle what is to come. It’s a great way to just add a little freshness to the living room, just by changing a few cushions. I’ve been doing this in my own home in the last week and I can’t believe what a difference it’s made. Have a shop around at somewhere like Marks and Spencers for inspiration and choice and just make a few updates. At this time of year it’s great to go for the soft and snuggly, but if faux fur and feathers aren’t your style there’s plenty more to choose from. The Christmas tree comes out and all of sudden your room can feel overwhelming and cluttered. A great trick to minimise this is to think about how you could rearrange the furniture to accommodate the tree more easily. Often, just removing one small table or chair from the room is enough to give you the space you need so it’s worth experimenting. I wouldn’t usually recommend a huge remodelling but if the tree is going to be up for quite a few weeks then maybe it is worth the effort. Stick to a simple colour scheme or theme and work that throughout the house. Think about your decor and work your Christmas decorations into it if you can. 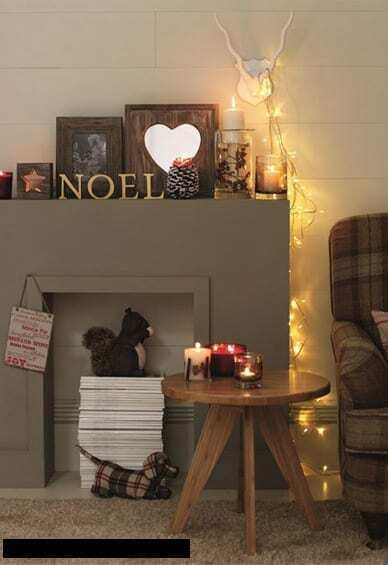 Remove some of your usual accessories and create a Christmas look with baubles, garlands and twinkling lights. Take a leaf out of the magazines and work a little staging into your home where possible. Give your room that Christmas wow factor! The House to Home magazine site is a great resource for lots of Christmas inspiration. And my final tip is to try to relax and enjoy it. Whether you have a Contemporary or Traditional Christmas home, do your preparations in advance, make lots of lists and try to stay well and healthy for the big day.